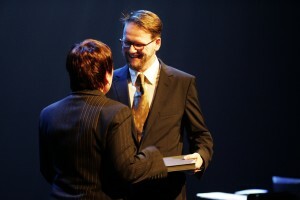 The Nordic Council’s Literature Prize, 2005, for Skugga-Baldur. I am a Sleeping Door, the third book of CoDex 1962 was awarded the DV Newspaper Culture Prize / Literature and nominated for the 2016 Icelandic Literary Prize. Moonstone – The Boy Who Never Was (Mánasteinn – drengurinn sem aldrei var til) is awarded the 2013 Icelandic Literary Prize and The Icelandic Bookseller’s Prize for the Novel of the Year. Jan Michalski Prize for Literature. The Icelandic Bookseller’s Prize for the Novel of the Year, 2005, for Argóarflísin. The DV Newspaper Culture Prize / Literature, 2002, for Með titrandi tár. for contribution to Icelandic literature. The DV Newspaper Culture Prize / Literature, 1995, for Augu þín sáu mig. Writer in Residence at The Potsdam Institute for Climate Impact Research (PIK), summer 2017. Guest of the Berlin Künstlerprogramm 2010-2011. Samuel Fischer Visiting Professor at the Freie Universität, winter 2007-2008.